It’s been one year since my celiac disease diagnosis. A quick reflection and the recipe that gave hope. 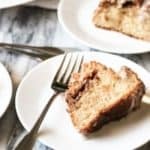 Pamela’s Sour Cream Coffee Cake – This is the first thing I baked that was gluten-free. 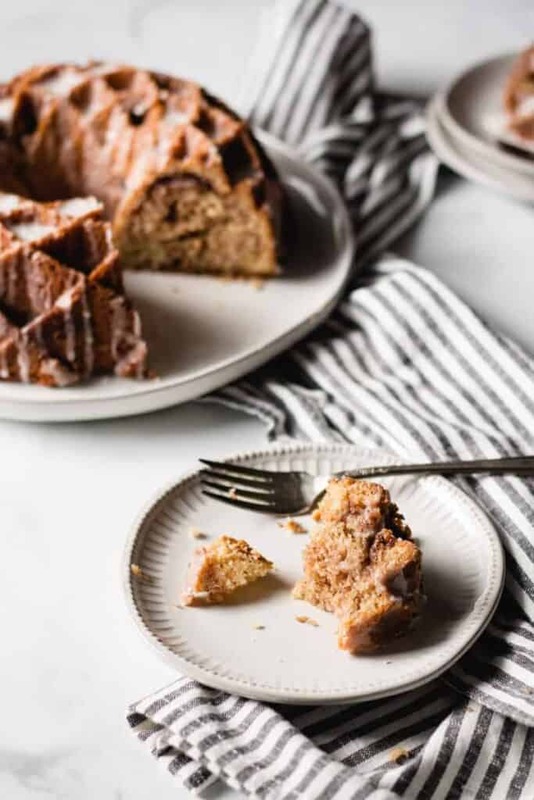 I still remember how I felt as I bought that bag Pamela’s Baking and Pancake Mix (affiliate link), as I made the recipe on the back. I was afraid. Not just that it wouldn’t turn out, but that life was never going to feel the same as it did before. In some ways it was harder. The gluten-free diet was easy to accept. I went gluten-free and never looked back. The concrete nature of the diagnosis gave me instant resolve. I don’t crave anything with gluten. I don’t even want to be near it, really. If I have to touch it, I feel… germy. The thought of cheating makes me shudder. I’m thankful for that because I know it’s much harder for some people. To me, gluten is like poison ivy. 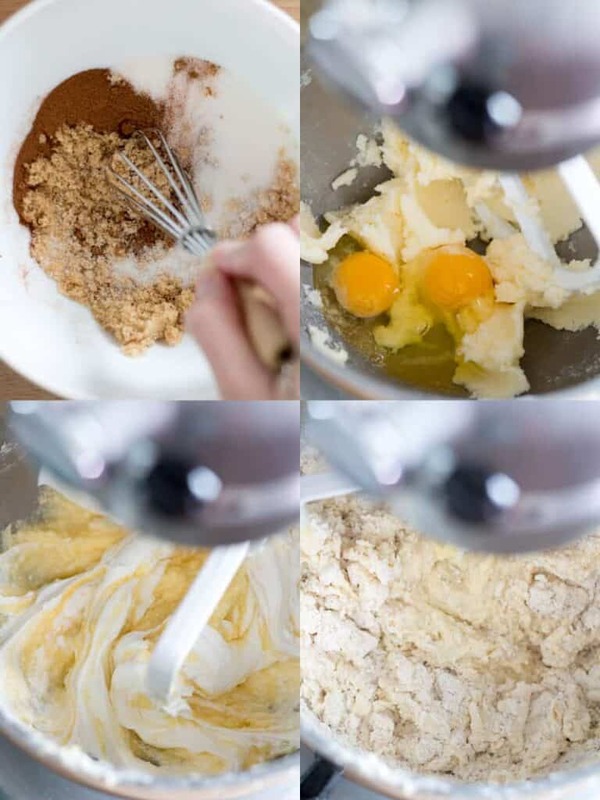 Mixing up the cake, just like any other cake. One of the hardest parts has been social situations. I get nervous about the food. Even if something might be safe, even if I know in my brain it probably is, I just won’t eat if I feel unsure. That means I end up hungry if I don’t plan ahead. Eating out is pretty much gone. I’m an introvert and I don’t really like being a bother. The thought of going to a restaurant, explaining my dietary restrictions, and still not really knowing if the food was handled safely is honestly enough to keep me at home. It’s just easier and safe. If the carefree nature of eating out is gone, why bother? Why have the stress of the unknown? I’m not proud of these things. Those are areas to work on for sure. I know I can’t live in a bubble forever. 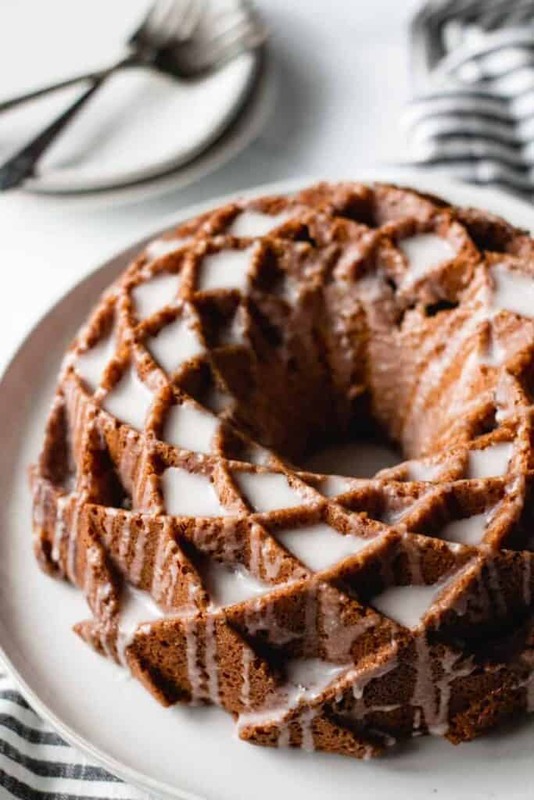 Layering the cake and swirling the top. The weirdest side effect has been nightmares. I dream constantly that I am eating gluten. In my dreams, I don’t want to be eating gluten but I do it anyway. It’s weird and I always wake up a little creeped out! It’s been a year and I’m still getting these nightmares… hopefully they go away eventually! As I cut the first slice, apprehension started to fade. 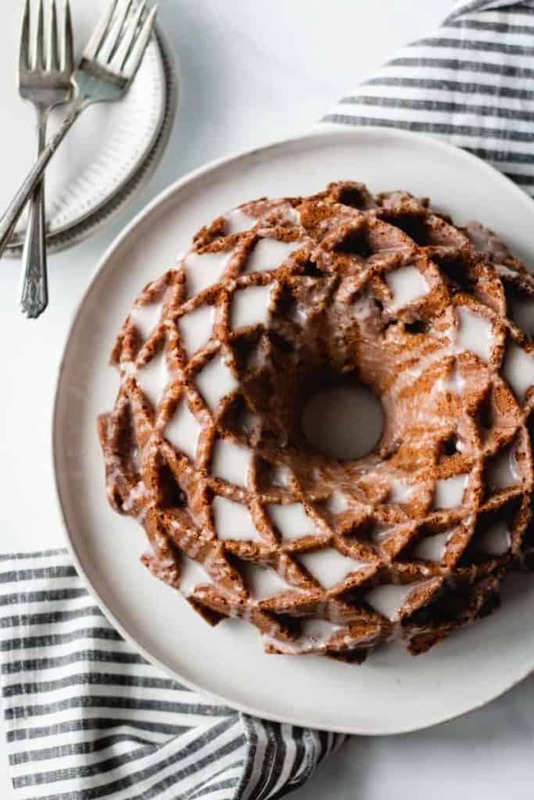 It looks like cake, it smells delicious… but how would it taste? I feel stronger. Healthier. A year of healing can do a lot. I think I’m so comfortable in my bubble because I know that I feel good. I know that just one bloated stomach means I’ve undone some healing. That’s just not worth it for food. Even though my body feels stronger and healthier, I also learned it was much weaker than I even realized. A bone density scan revealed osteoporosis/low bone mass. While the specialist I saw seemed optimistic about recovery, it made me realize just how damaging this disease is. How it wreaked havoc. It made me wonder… what else? What if? What else is deficient? What other parts of my body are hurting? What if I had fallen and broken a bone or a hip? I say that last one somewhat sarcastically, but also in complete seriousness. What if I had never been diagnosed? How much longer could my body have sustained itself? Thankfully I was diagnosed. Thankfully I know. Thankfully I’m strong enough in mind to say no. Thankfully, I’m healing. I sat in the kitchen, by myself, eating this piece of cake almost in tears. It was delicious! I knew right then, this might be hard but not impossible. I knew I could find normal again. 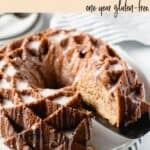 The most delicious coffee cake. 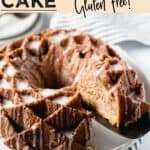 The cake that makes it all seem ok. Recipe from Pamela’s. Preheat oven to 350°. 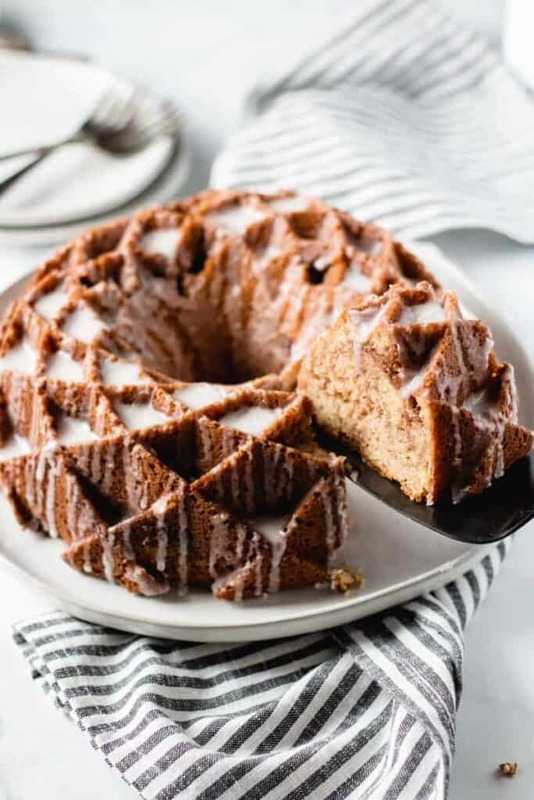 Grease 10-cup Bundt pan. Combine filling ingredients and set aside. Cream the butter and sugar. Add eggs one at a time, then vanilla. Mix in sour cream then baking mix. Spoon half of the batter into pan. Then half of the filling. Repeat with the rest of batter and filling. 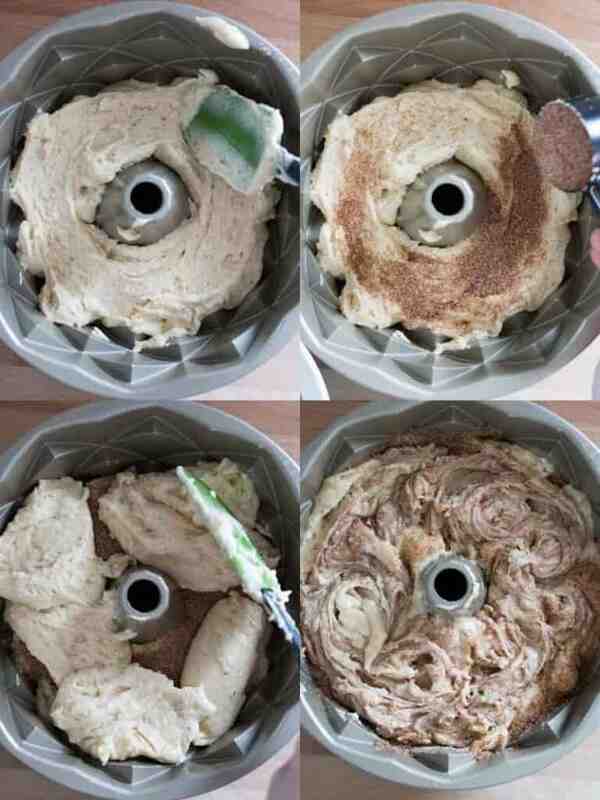 Use a butter knife to swirl the filling with the batter in the pan. Bake for 45 to 50 minutes, or until toothpick comes out clean. Cool 10 minutes before removing from pan. Mix together glaze ingredients. Drizzle the glaze over cooled cake. This one brought me to tears, because of your struggles and your strength. What a year! You’ve come through a victoriously! Well done.